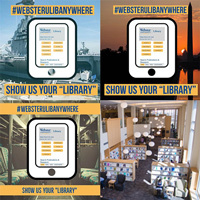 Students are encouraged to share photos of where they're using the library, anywhere around the world. To raise awareness of the accessibility of its services around the world, the library is excited to announce the Library Anywhere Photo Contest. For the month of March, students are encouraged to post images on social media that will tell their stories. Because so many library resources are available online, the “library” might be a Viennese café, military barracks, or kitchen table strewn with crayons. Share using the hashtag #websterulibanywhere. Learn more at http://libguides.webster.edu/thismonth. Entrants must be currently enrolled in classes at Webster University. Prizes will be mailed to distance learners. Tell us your story! Feature your location, study routine, or obstacles you overcome. Be entered into a drawing to win fun prizes!